Anyone’s who’s taught in front of a projector for any length of time has seen the incredible evolution of the capabilities that these devices have gone through. 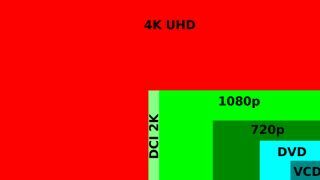 From the 1990s when VGA (640 by 480 resolution) was the only game in town to the current paramour of projection, 4K resolution, it’s been a continual upward trajectory. On the other hand, it seems to take forever for the new technologies to filter into the classroom, lecture hall or auditorium. Defined as capable of creating images with 3,840 by 2,160 resolution, 4K projectors put roughly 8.3-million pixels onto a screen for sharp detailed images. This easily blows away the competition, with HD projectors working with 2,073,000 pixels. The difference can seem like night and day with vivid and pinpoint sharp video streams. At the moment, according to Claire Kerrison, FutureSource’s projector analyst, Wide-XGA and W-XGA+ resolution projectors (1,366 by 768 and 1,280 by 800 pixels) are the top sellers to American colleges and universities with 46 percent of sales in 2016. XGA (1,024 by 768) and SVGA (800 by 600 pixels) devices accounted for 38- and 12-percent of sales. In the meantime, HD (1,920 by 1,080) and WUXGA (1,920 by 1,200) are just catching on with college buyers, capturing 3- and 2-percent of higher education sales, respectively. That leaves 4K devices as the new kid on the block. It’s sales niche that accounts for sales of roughly 0.5-percent, according to Kerrison. On the other hand, she projects rapid growth, with sales of 4K projectors increasing by 50-percent a year, albeit from a small base. Her forecasts show sales of 4K devices rising to 3-percent of total higher education sales by 2021. There’s a good reason for the increased demand for these highly precise projectors: the detail possible with 4K projectors is becoming a must-have for certain classes. In particular, she points to the use of 4K projectors in science classrooms and labs. There, they are essential for everything from showing electron clouds to visualizing complex data, like that from a particle accelerator. For instance, 4K can help with data visualization, such as in a business class looking at the intersection among a company’s sales, market capitalization and stock value. In fact, with the extra resolution available you can see subtle – or otherwise concealed elements – hiding in the data. These additional pixels really comes into their own when used in a computer aided design class to show a compound curve without the hint of jagged edges. Or, in an art history seminar, where the teacher zooms in on the intricate brush strokes of Vincent van Gogh’s self-portraits. Plus, if you’re making an experimental 4K movie or virtual-reality wraparound image, then it’s de rigueur to show it in 4K where every detail pops off the screen. Because 4K resolution is relegated to premium projectors, they often come with extras you wouldn’t normally expect to find on lesser classroom projectors. These can often include horizontal as well as vertical keystone correction (so the image can be made rectangular), image shifting (to put it exactly where you want it) and often precise control of the image’s color balance. Price is almost always the sticking point, with 4K projectors commanding top dollar. Part of this is because the components, engineering and optics are so new that they add up to expensive devices. For instance, in a side by side comparison, 4K projectors now carry a 60 to 65 percent premium over HD ones, according to FutureSource’s Kerrison. This should decline to 35 percent by the end of 2018, she estimates. This should not only spur acceptance in specialty uses, but gain a broader audience as well. As has been the case with HD- and Wide-XGA projectors before it, prices will continue to drop making the purchase decision easier to swallow. But, by then we’ll be onto something capable of delivering even more detail: 8K projectors.